Many e-commerce experiences are straightforward. It’s easy to buy and receive physical products, digital items, and services from established businesses like Amazon, Best Buy, GoDaddy, Fiverr, and others. Where e-commerce can get a little tricky, and potentially fraudulent, is when a person must transact with another individual directly. The more money involved in the transaction, the higher the risk to the buyer since the buyer typically must initiate the transfer process with a payment. Schemers and bad actors surf the net looking for people to scam. I haven’t been scammed, thankfully, but millions of internet fraud cases occur each year. One way to ensure your online transaction is successful is by using an escrow service. An escrow is a financial arrangement in which a third party holds and regulates the payment of funds required for two parties involved in a given transaction. It helps make transactions more secure by keeping the money in a neutral account. Funds are released when all the terms of an agreement are met. Many years ago, eBay, an online auction marketplace, partnered with Escrow.com to offer escrow services and reduce fraudulent activities. Escrow.com was founded in 1999 and is owned by Freelancer, an online freelancer marketplace. Escrow’s services help to safeguard transactions by withholding funds from a seller until the buyer receives and approves the good. While traditional escrow services can be costly and typically involve bankers and lawyers, Escrow provides services at affordable rates. Escrow.com handles purchases involving web domains, motor vehicles, contracted services, milestone transactions, jewelry, antiques, electronics, collectibles, and general merchandise. Parties are required to verify themselves before transacting. Escrow.com has partnered with Shopify to sell existing stores and several web hosting companies, for example, GoDaddy, to transfer domains. It offers a WooCommerce plugin for online businesses that need escrow services. Additionally, users can add custom buttons and links to direct buyers to Escrow. Buyers and sellers must create accounts on Escrow.com and agree to the terms of their arrangements. Either party can begin the sales process. The buyer pays Escrow, Escrow verifies the payment, and the seller is notified that funds have been secured. Payment options include wire transfers, credit card, money order, and PayPal. The seller ships/transfers the item to the buyer, and the buyer confirms delivery. The buyer has a set number of days to inspect the item and the option to accept or reject it. Upon the buyer’s acceptance, Escrow releases the money to the seller. If the buyer rejects the item, the process moves in reverse until the seller is back in possession of his good. The best way to estimate a transaction’s cost is to use Escrow’s fee calculator. 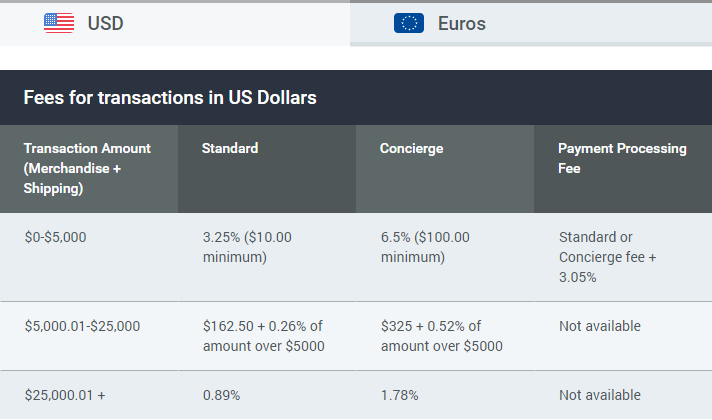 Fees are listed for US dollars and euros and differ depending on the transaction amount, for example, a transaction involving more than $25,000 will start at 0.89 percent. A few months ago, I was in negotiations to buy a website. The deal fell through when the seller and I couldn’t agree on who should proceed first. Naturally, neither of us didn’t want to be cheated. A few weeks later, I found another site to buy. After agreeing on a price, I recommended using Escrow to process our transaction. I created an account and clicked on “Start a New Transaction” and “Buy.” I selected the type of transaction and the role of the buyer. I entered a title for the transaction, the seller’s email address and phone number, and other standard details. I chose to split the cost 50/50 with the seller, but you may want to discuss that before proceeding. Escrow’s “Concierge Service” helps with transferring domains, but I didn’t use it. I paid Escrow via PayPal, and then an email was sent to the seller notifying him the transaction had begun. 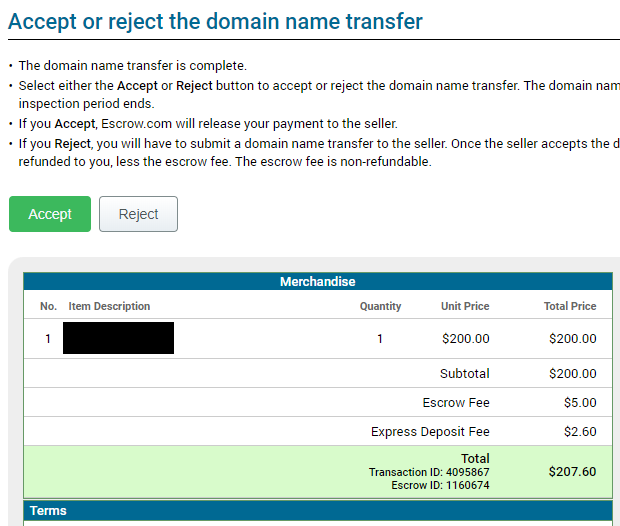 The seller accepted the terms and initiated the domain transfer. A few days later, I confirmed and accepted the transfer. There was nothing to inspect, since inspection is more useful for physical objects, for example, boats, toys, and electronics. The seller collected his funds, and our transaction was completed. Some reviewers have complained about using Escrow, but my experience was trouble-free, quick, and efficient. I can’t speak to transactions involving physical merchandise, but for domains and digital products, Escrow is an excellent option. I will use them to sell domains instead of domain brokers like Sedo and Afternic who do very little and charge a lot.